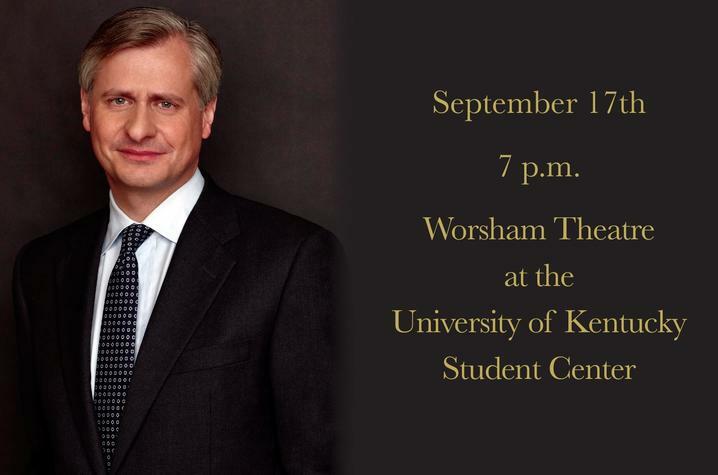 The Gaines Center for the Humanities and Kentucky Humanities present Jon Meacham as this year's Bale Boone Symposium speaker 7 p.m. Sept. 17, at Gatton Student Center. LEXINGTON, Ky. (Aug. 27, 2018) — The University of Kentucky Gaines Center for the Humanities and Kentucky Humanities announce this year’s Bale Boone Symposium: “An Evening with Pulitzer Prize-winning author Jon Meacham.” This event is free and open to the public and will begin 7 p.m. Monday, Sept. 17, in the Worsham Cinema at the Gatton Student Center. A reception and book signing will follow the presentation. Jon Meacham is a renowned biographer, presidential historian and author of several New York Times best-sellers including “Thomas Jefferson: The Art of Power,” “American Lion: Andrew Jackson in the White House” and “Destiny and Power: The American Odyssey of George Herbert Walker Bush.” Meacham is also a contributing writer to The New York Times Book Review, contributing editor at Time magazine, and a distinguished visiting professor at Vanderbilt University. As a capstone to Kentucky Humanities’ statewide literacy initiative Kentucky Reads: “All the King’s Men,” Meacham will be speaking on the relevance of Robert Penn Warren’s work, from politics to race to regional culture and Warren’s impact on literature and American culture. A complete schedule of Kentucky Reads events can be found at www.kyhumanities.org. Meacham’s latest book, “The Soul of America: The Battle for Our Better Angels” (Random House), will be available for purchase at the event. Kentucky Humanities is an independent, nonprofit affiliate of the National Endowment for the Humanities and is supported by the National Endowment and private contributions.